What makes the Lollipop School stand apart from other early childhood facilities? Its second-generation family ownership? Its ongoing reputation for excellence? Or its immense pirate ghost ship? Actually, it's all of those things. The stunning playground ship structure is a natural extension of the Lollipop School’s distinctive approach to learning. Along with his wife and his daughter, owner Jim Angelillo has continued the founding vision of his mother—to exceed expectations in providing an outstanding environment for early childhood development. Located between New York City and the New Jersey suburbs, the Lollipop School serves pre-K through kindergarten children year-round, plus summer day camps for kids up to 12 years old. Their playground hosts more than 100 children a day, and even more in the summer. So when the time came for the latest playground update, Jim knew they would need something with serious capacity and durability. Safety, as always, would be top priority. And there was something else. A vision. A pirate ghost ship vision, to be exact. "We already have a castle and a ship from Playworld," Jim says, "and they're great. But I wanted this to be something special, something big. Something nobody had seen before." 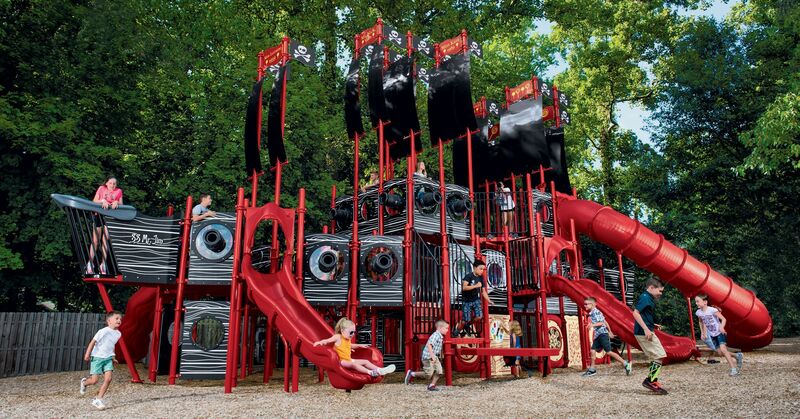 It took a team of people—including Jim, his wife Kara, Playworld sales rep Scott Fenton of George Ely Associates, and Playworld's engineering team—to bring the idea to life. From researching pirate ships online, through dozens of napkin sketches, and some creative new combinations of existing Playworld components, the pirate ghost ship took shape. Its signature black sails and black panels, part of Jim's original vision, were new, custom designs. The second-level deck, also part of the distinctive pirate ship look, created the perfect opportunity for the tube slide, irresistibly fun and reassuringly safe. With a mix of stock and custom ground-level interactive play panels, multiple slides, lookouts and cannons galore, this whale of a vessel keeps the entire crew occupied with adventure, imagination and most importantly, activity. From eye appeal to play appeal, it's been a hit with students, families and teachers alike—a rich source of quality play and exercise for the children at the Lollipop School. "We love it. The kids love it. And their parents love it," Jim says. "We couldn't be happier."